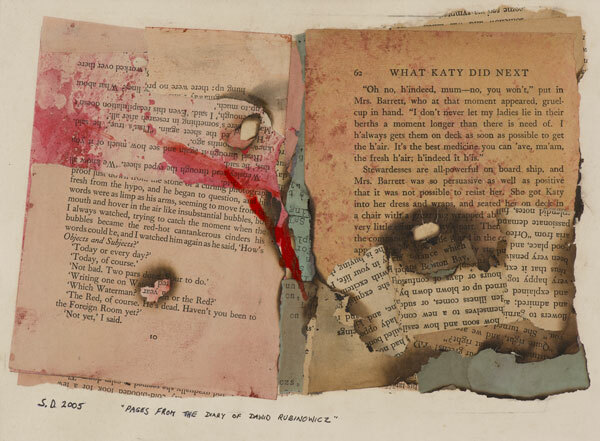 In this work, the artist avoids direct depiction of trauma, but using torn and burnt pages directly references the Burning of the Books authorised by the Nazis in Berlin on 10 May 1933. The subject of this work, David Rubinowicz, was born in Poland in 1927 and began writing a diary around 1940, documenting his experience of persecution as a Jew. His last entry comments on the joy of his reunion with his father, who had been sent to a labour camp. Three and a half months later, Rubinowicz was himself transported to the camp at Treblinka where he perished.